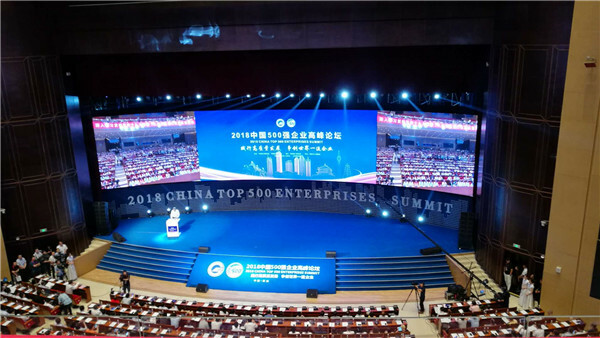 The 2018 ranking of the Top 500 Chinese Enterprises was jointly unveiled in Xi’an by the China Enterprise Confederation(CEC) and China Enterprise Directors Association on Sept 2.Anhui Xinhua Distribution Group,the only cultural and entertainment enterprise that is placed on the list,entered the ranking for the third time in succession , first time leaping into the top 400,a rise by 23 places from last year to this year’s 399th. This year, the threshold for the company to be listed exceeded 30 billion yuan,rising for 16 consecutive years.Revenues for China's top 500 companies stood at a total of 71.17 trillion yuan, up 11.2 percent from one year earlier, accounting for 86.05 percent of the country's gross domestic product (GDP). In addition, the 2018 list of Chinese Top 500 Service Enterprises was also released on the same day, in which the group was listed for 14 consecutive years, ranking 141th,being the first among China cultural and entertainment enterprises. In recent years, the group has further implemented Xi Jinping Thought on Socialism with Chinese Characteristics for a New Era and the spirit of the 19th CPC National Congress ,closely centered on the overall arrangement of the central government and Party committee and government of Anhui province,and has been determined to reform and innovate in a pragmatic way.The group has been actively exploring the path of transformation and upgrading.As a result,the overall economic strength has been the largest among domestic counterparts for five consecutive years and has been elected nine times on the top 30 national cultural enterprises list. In the new era, the group will continue to implement the spirit of the 19th CPC National Congress , focus on the development goal of the 13th five-year plan, speed up the construction of digital platform enterprise with culture education as the core and facilitate the constructing a beautiful Anhui guided by the five major development concepts.